Artist pirie1 knew what he was doing when he created this piece for Halloween. 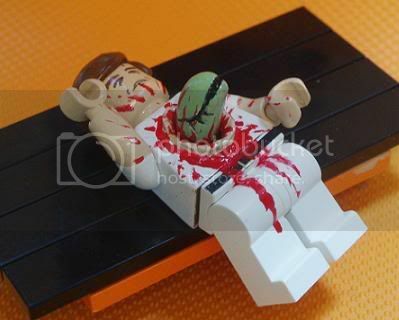 There’s something really striking about this photo of an Alien bursting out of the chest of a custom LEGO figure. The contrast of horrific violence against a normally-placid, mirthful visage. It’s like watching Dakota Fanning beat a homeless guy. Or seeing Barney drop the soap in a prison shower. Or witnessing the result when Santa Claus flies his sleigh too close to a 747’s jet-intake. Not that I’m enjoying coming up with these analogies or anything. Thanks to Brothers Brick, via ToyBender, for the find.